The Markar FM300 8’ Full Mortise Edge Mount Fire-Rated Pin & Barrel Type Continuous Stainless St.. 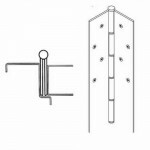 The Markar FM-100 7’ Full Mortise Continuous Hinge with template hole pattern supports doors weighin.. 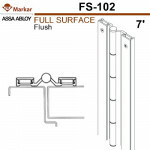 The Markar FS102 7’ Full Surface Flush-Mount Continuous Hinge that supports doors weighing up to 600.. 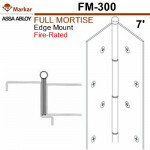 The Markar FM300 7’ Full Mortise Edge Mount Fire-Rated Pin & Barrel Type Continuous Stainless St.. 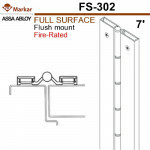 The Markar FS302 7’ Full Surface Flush-Mount Fire-Rated Pin & Barrel Stainless Steel Hinge suppo..